There was never any question for dedicated fans of How I Met Your Mother as to whether doubts about marrying Barney would ever be voiced by Robin, the only question was, how soon? Would it be when she called Ted in before her wedding, or would it not come until season 9? Something Old is the opportunity for her to finally voice the doubts and insecurities that have been festering beneath the surface since the engagement. In tonight’s episode, there are a lot of things that are voiced by the characters that we knew were coming. Ted, and the others, are obviously going to be upset about Marshall and Lily heading to Italy and the effects that may have on their friendships in the future. Robin is obviously going to have some doubts about her upcoming marriage, mainly for the fact that she’s marrying Barney, but also for the fact that Robin doesn’t seem to be the character who’s the most suited to be someone’s wife. The way which this episode voices these concerns is a very natural one. Ted’s confession of his true feelings about the bean bag chair is a bit corny, yes, but it’s also heartfelt, which is what HIMYM has made its following off of. On the other hand, Robin’s confession to Ted is anything but corny. It’s scathingly emotional, in a way that’s almost too raw, and the result is an extremely powerful scene. As I’ve already said, these doubts are no secret. We all knew she had them, but for her to voice them to Ted in such a well-acted and well-written way, well that does not bode well for the upcoming big day. On the note of that scene being well-acted, Cobie Smulders is frequently overlooked when the actors of this cast are talked about. Perhaps that’s because Robin doesn’t have the humorous moments that the rest of the characters do, but it’s episodes like this one that remind us what a talented actress she is, and she definitely deserves to be commended for her exceptional performance in this episode. The ending of the episode is certainly very interesting, and provides something that completely changes my outlook going into the last episode of the season. Ted and Robin holding hands, and the looks they gave each other, were much more than friendship. Any notion of that simply being a look of her gratitude needs to be snuffed out before it starts. She gave him the googly eyes. But Ted and Robin are not going to happen. Do we really need to deal with another season of this? I for one, want Ted to have moved on, and Robin to move on as well, even if it isn’t to Barney for good. Ted skipping his interview to go comfort Robin is almost too ridiculous though. Perhaps if it was just an interview to design another cowboy hat restaurant, but it seemed like this was a fairly big one. I get that he’s trying to be the good friend, and a part of him will always love her, but there’s a certain line that has to be drawn in terms of doing things for others above yourself. This moment crossed that line. Ted does provide some incredible wisdom at the end, a lesson that everyone should heed. There aren’t any signs. We don’t need the universe to tell us what we really want. We know what we want inside, without the universe’s help. That’s a realization Ted has long been lacking, but of course, it’s going to be some sort of sign from the universe that eventually brings him together with his future wife. This episode also served as a solid bounce-back in terms of humor. Ted’s ability to pack a lot in his fanny was a hilarious way to open up that end of the plot, and there are few things on the show more enjoyable than watching Ted be overly cocky about something as nerdy as possible. Barney and Robin’s dad playing laser tag was also great to watch, with a ton of funny moments to give breaks from the two very emotional plot lines. This episode serves as a definite bounce-back from the weaker ones we’ve seen lately. The balance of humor and heartfelt moments the show thrives on was back in a way that has been present far too infrequently this season. While not a great episode, this was definitely a quality one, and it looks like a good ending to season 8 may be in store. 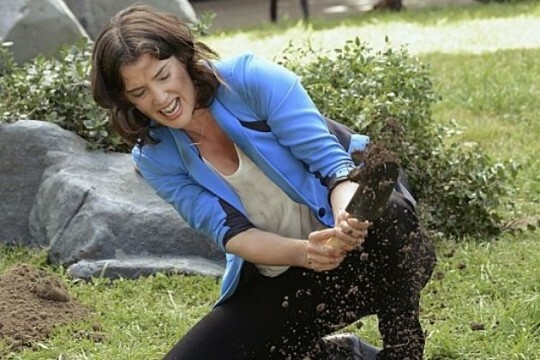 How much of Central Park can Robin dig up without someone showing up to stop her? New York City – It’s like Edmonton, but without arts and culture. Lily and Marshall’s King Kong fetish. Nothing else needs to be said. Marshall’s Sasquatch binders would definitely be a quality read. Check back next week for my thoughts on the next episode in the eighth season of How I Met Your Mother.